1890– A little over a year from when he was dismissed from the Force for “drunkenness and sentenced to three months hard labour. #1898 Constable James Cassidy accidentally drowned near Fort MacLeod. 1941– The day of infamy. The Japanese Imperial Navy attacks the naval base at Pearl Harbor Hawaii at dawn. This unprovoked attack brings the United States into WWII. As a result, the government of Canada reacts quickly and within hours the RCMP round up several suspected subversives. The next the day the Navy impounds 1200 boats in the Japanese Canadian fishing fleet. Eventually fear, paranoia and American pressure results in thousands of Japanese Canadian citizens being rounded up, their property is seized and they are interred in camps in the BC interior. 1969– At 04:15 am #25361 Constable Thomas L. Johnson responded to house fire at Manitou Beach near Watrous, Saskatchewan and learned that there were two elderly people inside. After obtaining a breathing apparatus he tied a rope around his waist and climbed up on the roof of the garage and entered the burning house through a second story widow. Feeling around in the smoke and flames he found the body of 59-year old Mrs. Mina Dragu sprawled on a bed and dragged her over to the window where he passed her outside to other rescuers. When he attempted to continue the search, he was forced to flee the house because of the intense heat and smoke. The remains of the first victims husband John were found several hours later after the fire was extinguished. His bravery in the attempted rescue was recognized when he was awarded a Commissioners Commendation and a cheque for $100. 1926 – Honour Roll Number 48. #9951 Constable Frederick Rhodes age 23 died from injuries he received, when the police detachment at Fort Rae, N.W.T., burned to the ground. At approximately 08:00 am Corporal #4290 Hubert Thorne heard a series of explosions come from the men’s quarters at the Fort Rae Detachment. Rushing outside he saw smoke billowing out the door and he ran to get a fire extinguisher. When he rushed over to the quarters he found Constable Rhodes lying face down in the snow badly burnt from the waist up. Standing beside him dressed in his burnt underwear was #9444 Constable Francis Armstrong. As the building burned to the ground Thorne and Armstrong carried Rhodes to the Corporals quarters and sent for the local priest to help dress his injuries. As they tended to his badly burned body, Corporal Thorne was able to piece together a statement as to what had happened. Constable Rhodes had gotten up and thinking that the fire in the stove had gone out, he grabbed a can of gasoline from the porch and poured some on the embers. The fire was still active and it burned up to the gas can and exploded in his hands and onto his body. Rhodes then attempted to fight the fire with a fire extinguisher and was found unconscious when Constable Armstrong fought his way through the flames to him. Constable Rhodes burns were so severe that he died shortly thereafter and was buried locally. Fort Rae was located on the northernmost arm of Great Slave Lake and was one of the most isolated posts at the time. The report that Corporal Thorne prepared had to be carried over 400 miles on foot to Fort Smith where it could be telegraphed to Ottawa. Frederick Rhodes had been in the RNWMP for three years and he was engaged to Miss Nellie Haigh of Yorkshire England. 1933– The RCMP patrol Cruiser No.4 observed the schooner “Kromhout” eight miles off Cape Breton Island. When they hailed the Kromhout she refused to stop and headed out into the North Atlantic. The patrol boat pursued her to 30 miles off shore and succeeded in boarding her and placing the ship under arrest. When she was searched, she was found to loaded with 5000 gallons of illicit liquor. The seizure of the Kromhout was one of the largest in the Forces battle against rumrunners and played a significant role in disrupting the illegal rum trade off Nova Scotia. 1975– Fredericton New Brunswick. Highway Patrol Constable #25366 Eric J. Suley was driving home after his shift when he smelled smoke. When he stopped to investigate, he discovered that a building was on fire. After calling for the Fire Department he rushed into the smoke-filled building and met a woman in the lobby and advised her to get out and then he ran up the stairs yelling “Fire” He was forced out of the building by the heavy smoke and learned that another woman with a child were still in the building on the second floor. Suley then ran back into the building and followed the sound of a child crying to the mother who was clutching the child frozen in panic. Constable Suley then took the woman by the arm and led her and the child out of the build to safety. When the fire department arrived shortly afterward they could not enter the building due to the intense heat and smoke. Constable Suley and the two women and the child had to be taken to the hospital and treated for smoke inhalation. For his bravery and presence of mind in saving three lives, Eric J. Suley was awarded a Testimonial Parchment for Heroism from the Royal Canadian Humane Society. 1991 – #39813 / O. 2019 Constable Amirik Singh Virk rushed into the Red Deer River near Red Deer Alberta and rescued a woman from drowning. For his efforts, he was awarded the Commissioners Commendation for Bravery. In 2013 Inspector Virk retired from the RCMP and was elected as a member of the British Columbia Legislature and was appointed the Minister of Education in the Christy Clark government. 2006– Commissioner Giuliano Zaccardelli, COM became the first commissioner in the history of the RCMP to be forced out because of controversy. Resigning as the 20th Commissioner of the RCMP he submitted his resignation effective December 15, 2006 to Prime Minister Stephen Harper. 1966– Former Staff Sergeant #11110 James Herbert Bilton is elected Speaker of the House in the 28thManitoba Legislature. Born at Leeds, Yorkshire England, Bilton joined the RCMP in 1931 and retired 22 years later. He was elected as the Progressive Conservative MLA for the Swan River Riding in 1960 and was the editor/publisher of the Swan River Star and Times newspaper. 1970 – British Trade Commissioner James Cross returns to London after two days of debriefing following his release by FLQ terrorists. 1975– #28450 Constable Anthony “Tony” Williams was making an evening foot patrol in Kamsack Saskatchewan when he saw a man inside the hardware store loading a rifle. The suspect had gained entry to the store via the building skylight so Constable Williams kicked in the plate glass door and at gunpoint ordered the man to drop the loaded rifle. Taken by surprise the thief complied and was arrested. For his bravery and initiative Williams was awarded the Commanding Officers Commendation. 1900 – Constable #370 Alexander MacKenzie who served from 1879 to 1900 and was invalided was granted pension by Order in Council of 33¢ per day. 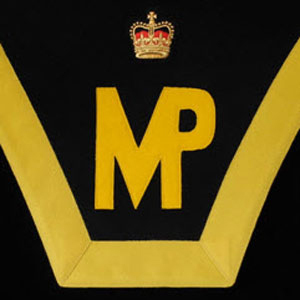 1946 – Honour Roll Number 84. #12983 Constable Wilfred James Cobble died of injuries he received, when he was struck by a truck on the highway, at Lavoy, Alberta. At approximately 7:00 pm on December 3rdConstable Cobble #10729 Corporal Augustus A. Cantrill were driving back to Vegreville from Inisfree when they found a truck loaded with coal parked on the side of Highway 16 without any lights on. They located the driver and returned him to the scene and instructed him to either repair the vehicle or tow it away. While Cantrill waited in the police car Constable Cobble went to the front of the truck to write down the licence number. While he was writing his notes Cantrill observed a truck coming towards them and flicked lights to warn the approaching vehicle. The truck drove past the car and then slammed into the coal truck. Constable Cobble was propelled to the shoulder of the road and was found unconscious suffering from a fractured skull. With the help of a civilian who stopped at the scene Cantrill loaded his partner into the back of the police car and rushed him to the hospital in Vegreville. While the medical staff attended to the policeman Cobbles wife Kathleen was rushed to the hospital. He died with her by is side at 4:00 am the following morning. Wilfred James Cobble had a varied career in the RCMP. He had served on the musical ride and been a dog handler. He was buried at the Riverside Cemetery in Vegreville Alberta. 1973– The Trudeau government passes a bill outlawing wiretapping and other forms of electronic surveillance except by police forces. 2000– Constable #49421 Tony J. Vienneau was returning home from a course traveling across the bridge over the Saint John River in Perth-Andover New Brunswick when he observed a 15-year-old boy standing on a 15-inch rail on the bridge in -27-degree weather. After radioing for assistance, he approached the youth and learned that he was going to jump to his death because of family problems. Constable Vienneau then climbed up on the rail and then spent over an hour talking with the despondent boy and eventually convinced him to go with him to the hospital. Due to the extreme cold both Constable Vienneau and the boy had to be treated for hypothermia. On October 27, 2003 Constable Vienneau ward awarded the Commissioners Commendation for bravery. 1978– Former terrorists Jacques Cossette – Trudell and his wife Micheline Lanctôt return to Quebec from exile in Cuba and France. He and members of his Liberation Cell of the Front de libération du Québec (FLQ) had kidnapped British Trade Minister James Cross from his Montreal home on October 5, 1970. When the location of Cossette-Trudel’s hideout was discovered by the police, they negotiated his release that included the publication of the FLQ’ political manifesto, a demand for the release of 27 convicted FLQ militants and the safe passage to Cuba for he and his wife and four other terrorists. Cossette-Trudel and his wife stayed in Cuba for four years before seeking asylum in France. In 1977, then Quebec Premier Rene Levesque stated that he was seeking a pardon for the pair. On this day, exactly eight years after the release of James Cross and their flight from justice to Cuba, the two terrorists retuned to Canada. They plead guilty to charges of kidnapping and attempted extortion on December 13th 1978, and were sentenced to five years’ probation and two years in jail. After serving only eight months of their sentence they were released on parole! 2003– #44673 Constable James Shields awarded a St. John Ambulance Lifesaving Award for saving the life of a boy who had fallen through ice at Mineville, N.S. A civilian had pulled the child out of the icy water and upon his arrival at the scene Cst. Shields performed CPR until paramedics arrived. 1970 – FLQ terrorists kidnap victim British Trade Commissioner James Cross, is found alive by police after they surround house in Montreal. 1971 – 45-year-old #15600 / O.858 Staff Sergeant Lloyd Stancil Smith and #21226 Corporal William Sanford Hacock age 32, earned Commanding Officers Commendations after they responded to a shooting in Colwood BC. At approximately 3:45 pm the detachment received report that a shooting had occurred in a Canadian Pacific Railways crew train. The two policemen accompanied by Corporal D. Peterson and Constable B. McCombe rushed to the scene and S/Sgt. Smith spotted a man lying on a bunk in a railway car. When Smith spoke to him, the man rolled off the bunk and yelled, “he’s got a gun” as a second man entered the car with a shotgun. Smith yelled a warning to the others as the two men began to fight and then the gunman ran out of the rail car. Then Smith saw that the man from the bunk was suffering from a gunshot wound and was then transported to hospital by ambulance. The gunman advised S/Sgt, Smith that he had no quarrel with the police but he was not going to give-up his gun. As Smith kept him distracted, Corporal Hacock climbed on the roof of the railway car and worked his way in behind the suspect. When the opportunity presented itself, he rushed the gunman and seized him by the legs causing him to drop the shotgun and was arrested. 1974 – Fort MacLeod Alberta, constables #30876David C. Lock and #31463 James Arthur McGibbon received a complaint that three youths had guns and were firing them into the air. The constables located the trio inside a local restaurant and approached them. The youth then pointed their weapons at the police officers and after talking with the boys for several minutes they succeeded in disarming them. In recognition of their courage and the calm manner in which they handled the dangerous situation both men were awarded Commanding Officers Commendations. 1986 – Special Constable Harvey Russell Black of the Fond du Lac Saskatchewan rescued the life of a fellow member from the waters of Lake Athabaska. The men were traveling across the lake ice in a snow vehicle when the ice gave way and they plunged in to the water. For his valour Constable Black was awarded the Commanding Officers Commendation. 1995 – #43217 Constable S.F. Bruinsma received commendation when he entered burning building and rescued a disabled man at Selkirk, Manitoba. 2003– It was a busy day for Surrey British Columbia Dog Handler, #41509 Constable Dean Muir and his dog “Lar”. They caught four car thieves in three separate incidents in the one-day.